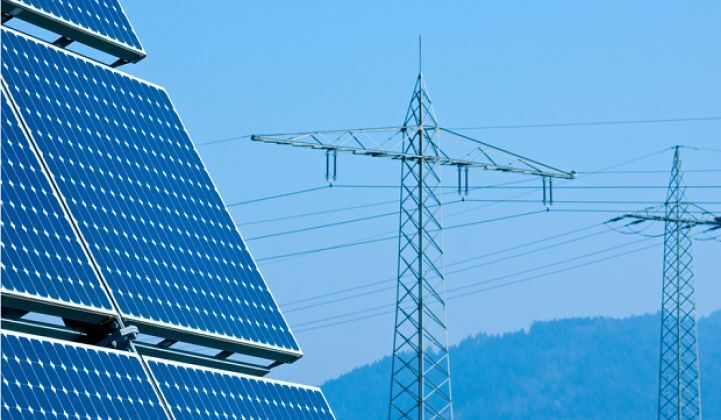 The solar industry is once again on the verge of increasing voltage to lower costs. The average cost for a 20-megawatt fixed-tilt utility PV project in the U.S. in 2015 is just above $1.50 per watt -- relatively cheap in historical terms. However, with record-low PPAs being signed at these levels, even subtle changes in component costs can kill projects. 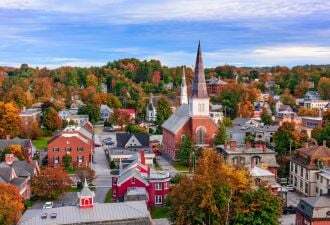 Additionally, with the looming federal Investment Tax Credit drop, it is as important as ever that utility solar continue to find ways to lower overall system costs. The most immediate opportunity that we see for utility-scale PV system cost reduction is the installation of 1,500 Vdc systems. Higher-voltage systems enable longer strings, which allow for fewer combiner boxes, less wiring and trenching, and therefore less labor. According to our research, installing 1,500 Vdc systems in place of now-standard 1,000 Vdc can lower costs by as much as $0.05 per watt. These advantages make high voltage use seem like a foregone conclusion, but there are a few market and regulatory barriers to these systems. History explains the challenges well. If this conversation seems familiar, it’s because we’ve had it before. Prior to 2013, most systems in the United States were installed at 600 Vdc, while systems in Europe were installed at 1,000 Vdc. This enabled lower system costs in Europe, while installers in the U.S. were kept at low voltages by UL testing limitations and the National Electric Code, which limited voltage to 600 Vdc due to a broadly interpreted revision added in 1999. In 2013, however, many authorities began allowing 1,000 Vdc systems for commercial and projects, and UL standards evolved to enable this. The switch was relatively simple, as most PV products were already built for European markets and thus manufacturers only had to recertify those products. 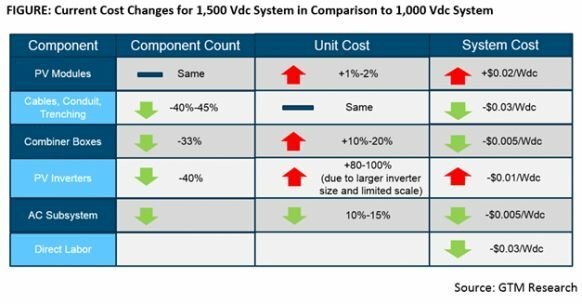 From an installation perspective, the shift to 1,500 Vdc has similar benefits and regulatory barriers to the 1,000 Vdc transition. However, there are a few distinct differences that make this shift more interesting. When 1,000 Vdc systems became prevalent in the United States, there was already widespread availability of products from Europe, and thus the testing standards were the main barrier. Testing standards are also a barrier to 1,500 Vdc, but 1,000 Vdc is still the standard voltage in Europe, and so there is also exceptionally limited availability of 1,500 Vdc products. This doesn’t mean Europe didn’t lead the U.S. again with 1,500 Vdc. Europe’s electrical standards body, the International Electrotechnical Commission (IEC), considers 1,500 Vdc the low-voltage limit and enables certification to that voltage. The first partially 1,500 Vdc systems were installed by Belectric in Germany in 2012 using inverters and electrical equipment developed by GE (with Converteam’s technology) and Padcon. These systems used bipolar configurations, where positive and negative 1,000 Vdc strings were combined to switch at 1,500 Vdc. In the U.S., the leading proponent of 1,500 Vdc has been First Solar, which hopes to use 1,500 Vdc to help make up for efficiency limitations of its CdTe modules and lower associated balance-of-systems cost. First Solar’s Series 4 module was among the first 1,500 Vdc modules to the market and the company has aggressively pushed its partners to develop compatible system components. In 2014, First Solar became the first to install a fully 1,500 Vdc system with two pilot projects in Texas. As a result of these industry efforts, 1,500 Vdc parts are now commercially available for every system component. But module manufacturers are limited by the existing standards landscape. Accordingly, prices remain high, as production of these products is not yet at scale. Product availability has been the primary barrier to 1,500 Vdc in Europe, but product introductions have been hampered by standards in the United States. Nobody wants to introduce a product that is unable to be used in the U.S. market. UL 1703, the gold standard for PV modules, currently only enables module testing to 1,000 Vdc. However, due to market demand, broad changes are looming in the near term to enable 1,500 Vdc certification and harmonize U.S. and international standards. We expect all standards issues for 1,500 Vdc to be resolved in the next two years. 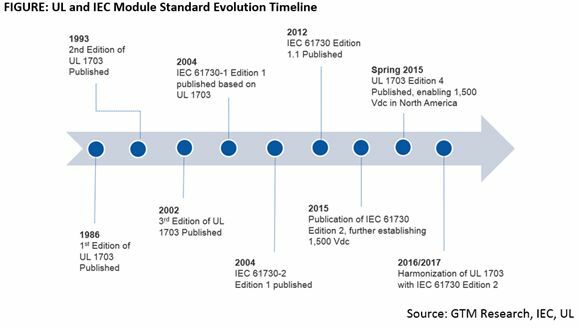 Changes to UL 1703 will be followed by alterations to connector standards and harmonization of inverter standards (which already enable 1,500 Vdc certification) to international standards. As these regulatory barriers dissolve, manufacturers will begin to introduce 1,500 Vdc products in volume. We expect this to begin in mid-2015 and continue into 2016. 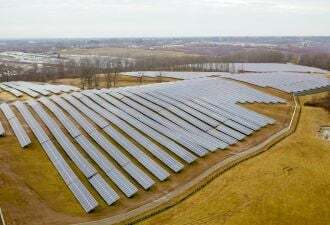 The market will initially target large utility projects with central inverters, but we expect three-phase string inverters to follow soon after. 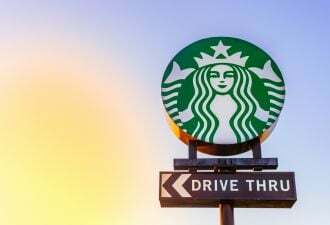 This will be further enabled by the implementation of next-generation silicon carbide devices that allow for higher switching frequencies and greater power densities. Higher-voltage systems provide an opportunity for improved system economics, but these systems will be limited to 1,000 Vdc and 1,500 Vdc. Incremental increases in voltage to 1,700 Vdc or 1,800 Vdc are unlikely due to the significant cost to develop products and change standards while only providing marginal benefits. Inverter standards in the U.S. have been written to potentially enable 2,000 Vdc bipolar arrays, but we do not expect this internationally, as 1,500 Vdc is considered the low-voltage limit by the IEC. Anything above that is qualified as medium voltage transmission and comes with a different set of rules and standards. With that said, changes in standards and technologies are driven by demand, and so nothing is impossible. Manufacturers and system providers will take the path of least resistance to lower costs and improve system economics. Anything is possible in the long term, even medium-voltage systems. In the short term, however, 1,500 Vdc systems are coming fast, and the industry eagerly awaits. Scott Moskowitz is a solar analyst with GTM Research and the author of the recently published report The Global PV Inverter Landscape 2015: Technologies, Markets and Prices.